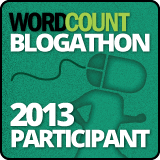 The 2013 WordCount Blogathon has officially begun! For those who haven’t heard, this is an annual blogging event coordinated by professional blogger and technical writer Michelle Rafter. Every year Michelle challenges all kinds of bloggers to post content to their blog(s) every day for a month. Think of it as NaNoWriMo for short attention spans. Daily blogging can be a challenge. There are days when you just don’t feel like it. Other days your Muse calls in sick. Sometimes technology conspires against you severing your internet connection or throwing other hurdles, from power outages to lost passwords, in your way. Clients, kids, employers, spouses and friends distract you until it’s too late to post on a given day. The rewards for overcoming the challenges are tremendous. It’s not just the great prizes you could win. It’s what daily deadlines do for you, professionally and personally that make events like the WordCount Blogathon worth doing year after year after year. Get into the habit of being productive. Become comfortable with short deadlines. Learn how to overcome writer’s block, set priorities and multitask more effectively. Increase your knowledge of and familiarity with your chosen blogging platform. Connect with an amazing and diverse group of creative people who share your passion for writing and blogging. Get more comfortable promoting yourself, your writing and your blog. Discover some valuable and useful resources, as well as learning to use them. Build your audience and your reputation as a blogging expert in your niche. The most important reward you will take away from the WordCount Blogathon however is self-knowledge. At the end of the month you will know more about yourself, how you write, what kinds of writing you enjoy most and least, when you are most and least productive and what motivates or inspires you, then you did when you began your daily blogging adventure. On top of that, you will have demonstrated to your most important and critical audience, yourself, that you can write content that others will read every day. You will walk away empowered and more confident, whether you are just starting your blogging career or already an established blogger. Accept the challenge. You can do it. You’ll be glad you did! Thank you! Glad to have you aboard this year! Looks like it’s going to be a great time! Yes, me too. I can’t wait to see what more you have for us as the month unfolds. I’m even more excited about the Blogathon now that I’ve read (and shared) your post today! Thanks, Susan. Blogathon is always a great time. One of the things i love most about it is discovering new blogs like RippleSpillers! I can’t believe I didn’t know about it. What a wonderful premise! Looking forward to accepting the challenge with you and all the other blogathon participants! Thanks for the words of motivation. Thanks, Debroah! Blogathon is always a great, if busy, time! Glad you could join us. I look forward to reading your blog. With every blog challenge I’ve participated in I find many benefits. Benefit number one is I’m able to connect with people I wouldn’t have otherwise connected with. I know peoples attention spans are short which is why my posts are what I call Micro Bursts. These short bursts of information can be easily digested by others:) I’m challenging myself for June to do video posts except for Saturday which is my fashion day and Scenic Sunday. Wow! That’s taking #Blog2013 to a whole new level, Toni. Not sure I’m up to doing two video blogs a week but I might try a couple random ones in June after Sunday’s Screenwriting U webinar. I still haven’t tried Vine for Twitter out either and probably should. I’m looking forward to watching yours! Are you hosting them on your blog or posting them to YouTube? I just signed up for the Sunday Screenwriting U Webinar:) As an award winning videographer I like to see what others say about video. I’m looking forward to the webinar and I’ll be interested to hear your thoughts on it. I agree completely with all that you wrote. Joining blogging challenges have really been very helpful. Happy blogging!